Every so often, a candid examination of current events makes famous incidents in American history altogether relevant again. In my mind no incident demonstrates this more than the Stamp Act Crisis of 1765. Few episodes in American history have so effectively proved how to confront and end the enactment of malignant and unconstitutional laws. In 1765, the standard American position held that the Stamp Act violated the bounds of the British constitutional system. 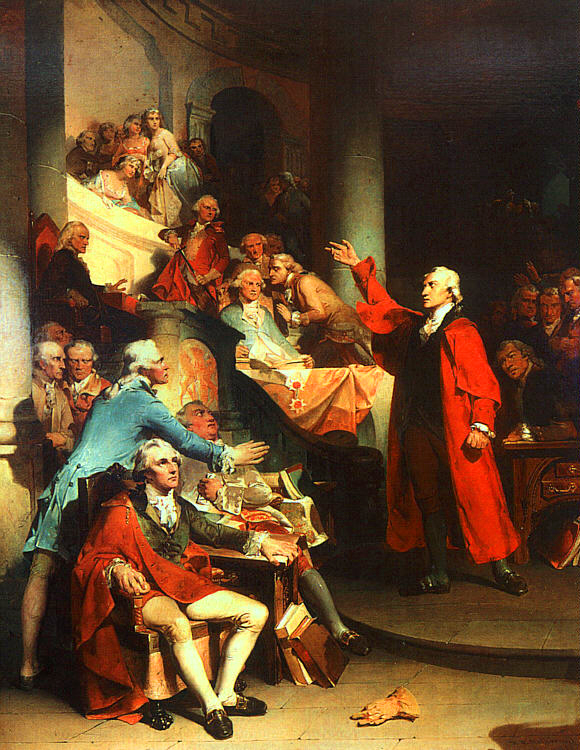 Objecting to the notion that Parliament was supreme, and could pass impose whatever binding legislation it wished upon the colonies, the colonies instead adopted the rigid stance that colonists could only be taxed by their local assemblies. This idea, they thought, stretched all the way back to 1215 and the Magna Carta. Ready to defend this view, and knowing that they lacked the representation in Parliament to combat the abhorrent act, the colonies employed a variety of tactics to thwart the enforcement of the law. This strategy was most famously employed in Massachusetts by Sam Adams and the “Loyal Nine,” a precursor to the Sons of Liberty. There, a large group of patriot agitators and merchants aligned against Andrew Oliver, the British agent responsible for enforcing the stamp tax in the colony. A massive gathering of people hung Oliver in effigy from a liberty tree. “Liberty, property, and no stamps!” became their rallying cry. The protestors even conducted a mock funeral procession, where they took the corpse to the top of a hill, stamped it, and burned it in a bonfire. The next day, a group of patriots convinced Oliver to resign from his post, and vowed to do the same for any replacement officer sent to enforce the Stamp Act. While Massachusetts usually receives sole recognition and adulation for its stance on the Stamp Act, the nullification effort against the law did not start or end there. In fact, the strategy to combat the callous law was widespread, and several states resisted even more fiercely than Massachusetts. Some of the most important though overlooked events in the campaign against the Stamp Act sprang forth in the South. Patriot firebrand Christopher Gadsden, who also garners reputation for designing the Gadsden Flag, was instrumental in the Stamp Act resistance movement in South Carolina. There, his efforts motivated South Carolinians to burn the stamp papers, and his supporters persuaded two stamp distributors within the colony to flee. The same tactics were utilized by most of the other Southern colonies. Therein, hostile groups seized stamp paper, pressured officers to delay the law’s enforcement, and forced the stamp distributors out of commission. Outside of the campaign to meddle with the enforcement of the Stamp Act, those who resisted the law also convinced their colonial assemblies to pass resolutions that asserted the natural rights of the colonists and the idea that the Stamp Act was unlawful and void. Although North Carolina governor William Tryon attempted to convince the people within his colony to accept the tax, they would have nothing of it. When the ship carrying the tax paper arrived, the colonists refused the ship to be docked. Additionally, a crowd of convened to “greet” its designated stamp distributor, William Houston. They proceeded to lead him the local courthouse, where the clamor of several hundred people demanded him to resign. Houston agreed to do so on the spot, and the patriots celebrated into the night with drink and bonfire. While we live in an entirely different time, I think western civilization can learn much from the response of the southern patriots of 1765. Rather than hoping the next election will produce preferable results, or waiting for the courts to weigh in on controversial law, the patriots took a fierce stand against an odious law. In doing so, they inspired tireless masses to their cause, brought about a reversal of policy without representation in Parliament, and changed the world as we know it. Even today, using noncompliance measures that foil the enforcement of the most treacherous laws can be applied to almost every modern abridgement of the Constitution. Though many of the most provocative acts go virtually unchallenged at a local level, state governments have successfully used their own local authority to evade federal attempts to prohibit marijuana and create a federal ID system. Applied to other issues, and other endeavors, acts from a faraway government may be rendered impotent. Edmund Morgan and Helen Morgan, The Stamp Act Crisis: Prologue to Revolution (Chapel Hill: University of North Carolina Press, 1995), 188. Murray Rothbard, Conceived in Liberty (Auburn: Ludwig von Mises Institute, 2011), 894.